Storytelling is both my passion and my profession, but there are subgroups within storytelling. Sean Buvala, acting as my coach, asked me, "If money was no problem, what type of storytelling would you most like to do?" HISTORY! I said, but not history as viewed by somebody famous...history as seen by the "average" person. Books, television, and often movies, when looking at history focus on either someone famous or on many people without seeing life as it appeared to the "average" person. This type of program takes similar research, so it doesn't come quickly. That makes it hard for historical societies and museums, schools, and libraries to produce their own programs. Added to that, coming in the persona of an individual from back in time does something movies, television, books, and even the authors of those books can't do, present a living, talking person who can react to the audience and its interests. Liberetta Lerich Green was a very real woman who grew up here in Michigan on an Underground Railroad Station and later helped her parents in their abolition efforts. She was here on the homefront when her brothers fought with the "Fighting Fifth" Infantry. (I must mention here my separate blog, Michigan's "Fighting Fifth" Civil War Infantry. Local newspaper articles on that regiment appear at the pace they appeared 150 years ago, just as the families and friends of that regiment tried to follow what was happening to the boys they loved.) I also have copies of letters her brothers sent home and a few by her parents trying to see if their sons and others they knew might be in a military hospital needing help. Liberetta's parents, Sarah and Peter Lerich, came here as pioneers before statehood. Teachers and elders taught Liberetta about pioneer life and even the War of 1812. Additionally Liberetta was a Macomb County farmer's wife and later widow, and she raised three boys and three girls, including one, Loa, who was a pioneering educator. As Liberetta I've had the joy of telling about her family's contributions and what life was like for them and what she learned from others. Beyond Liberetta there have been what I call "generic" characters. The Michigan Arts and Humanities Touring Program posted a video of my One-Room Schoolteacher. I also have a character I call The Hired Girl, a position common to many women of all ages. ("Girl" is how she might be called back then.) 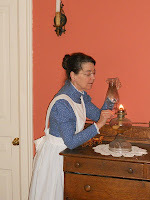 It was a way for women to work beyond their own homes. The Hired Girl can let me also include folktales she might have heard in addition to talking about her work. The Hired Girl is able to explain how a Victorian Christmas was celebrated, too. My researching One-Room Schools and their Teachers as well as Victorian Christmas led to posts here. (Check the sidebar to find the many posts here that have come from Liberetta and these various historical programs.) While still working as a librarian in Mount Clemens, which has a history going back to the Bath House Era, I even took the Hired Girl and worked as a "Rubber", a person involved in the baths and massages of these long ago spas. Just for fun, I also have a program that, like Liberetta telling about the War of 1812, was developed for the Lorenzo Cultural Center's series of historical programs. Why do I say "just for fun"? It looks at my own childhood growing up and "Skipping Through the Halls of Fifties Memories", both the things I noticed and things going on all around me that I was too young to notice until grown-ups told me about them later. It's a great way to get an audience recalling their own childhoods for oral history programs. Where in time will I go next? I don't know. Right now I'm beginning work on the story of a Polish woman's emigration to the U.S. I'm in the state's Touring Directory, so my programs qualify for state grants. It's hard to guess what might be requested next, but it will be fun using my Storytelling + Research skills to bring to new audiences "History as seen by the 'average' person."